At ATE Solutions we pride ourselves in providing an excellent and supportive work environment where everyone can develop, maximise their skills and progress towards their career goals. Innovation and change is our environment and our people hold the key. We are committed to investment for the future through our training, on-the-job learning and by providing the right tools and resources to ensure everyone feels fulfilled in their work and willing to go that extra mile to deliver our promise. Our success is driven by our dedicated and motivated employees, who genuinely feel part of the ATE team, collaboratively working towards our company goals. Overview: Founded in 1998 ATE Solutions is a vastly experienced test solution manufacturer and one of a few companies providing the complete test solution, from custom test system design and build all the way through to test fixturing, mechanical design and test software. 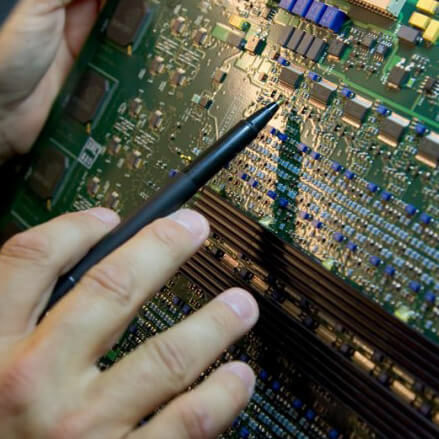 As a trusted partner to major blue chip companies we have over 3000 installed test applications, and global customers across sectors such as: aerospace, automotive, defense, energy and Rail. Our highly successful range of FLEX test systems is driving ever increasing market demand, and to keep pace we need to expand our application teams. Job Purpose: The role of Test Development Engineer will require you to engage with our customers and your colleagues in a team orientated company. You will be responsible for design, development and testing of both hardware and software to ensure the highest quality products. To design and develop electronic test applications for functional test. Define the test approach and document the project scope for each project. Test Program Generation using LabVIEW™, TestStand. Commissioning of Test Applications on site at customer premises. Ensuring that procurement, design, development, test and implementation is within project scope and budget. Support the preparation of project proposals and specifications for external bids. Act as our customers ‘go to’ contact point for all technical and non-technical queries. Formal engineering qualification in electronic engineering/electrical design. Ideally degree qualified in Electronic Engineering, or other related subject. HNC/D in Electronic Engineering may be considered. Previous and extensive industry-related experience. Prior experience of working in a test development role and knowledge of standard instrumentation such as PXI, LXI, GPIB Instruments etc.. Previous experience and working knowledge of NI software design and using languages/tools such as LabVIEW™, Test Stand, to produce functional test programmes. Experience of custom hardware design would be an advantage. Previous experience of electronics and test development equipment interfaces, test system architecture and electro-mechanical engineering. Excellent organisational skills and ability to work on a variety of projects. Strong verbal and written skills, including technical presentation skills. Good communicator at all levels, including external customers and suppliers. Good team player and contributor. Strong planning and time management skills – able to define and meet deadlines and targets. Takes ownership and responsibility for personal actions/contribution and projects. A practical problem solver of complex tasks and can demonstrate these skills. Full UK or EU Drivers Licence. We are now seeking enthusiastic, collaborative and forward-thinking electronics engineering graduates to join us in the summer as part of our Graduate Recruitment Programme. Joining us as a graduate means you could be working on cutting-edge projects & driving critical initiatives while developing your practical and theoretical knowledge surrounded by industry experts. We understand the importance of nurturing new talent in our business. In return we offer an opportunity to work across a wide range of specialist areas, external and on-the-job training and support from a workplace mentor. Our Company has an enviable reputation for supplying quality products and service and we’re looking for people who possess the right skills and attitude to match. Do you think you could be committed to our business? We look for those who are enthusiastic with good communication skills, whilst academically you need to be in your final year of university or have achieved an Electronic Engineering Degree. Ideally, you’ll hold a valid full UK driving license.